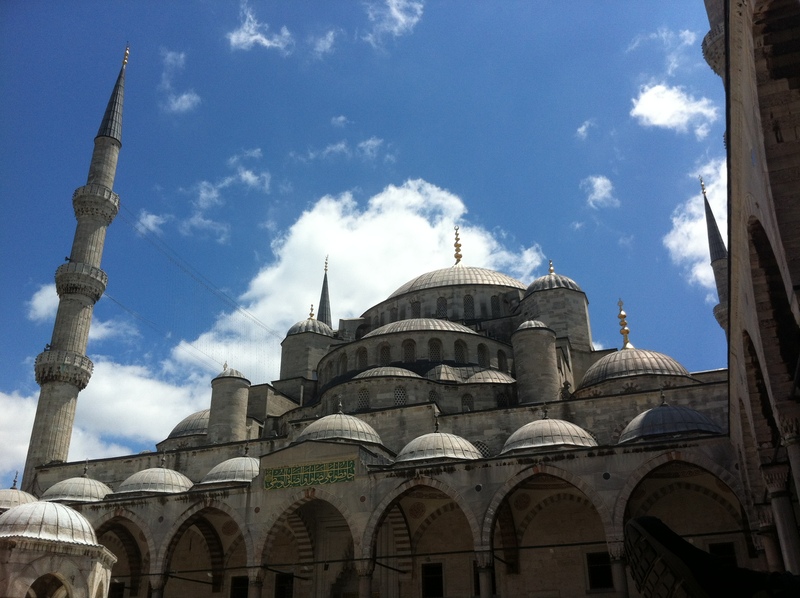 In the side rooms of Istanbul’s Sultan Ahmed Mosque, the debate between reason and revelation—logic and faith—defies the “norm.” Here, one Turk’s Islam favors reason over revelation, and three American Christians disagree. The room was small and carpeted. Where there wasn’t Arabic calligraphy, there were books, and where there weren’t books, there were the small, 17th century windows set high in the wall. Low, cushioned benches lined most of the room, welcoming any visitor who was interested in more than just the architecture of the mosque. Where the benches ended sat the Imam’s humble desk, as if to preside over a meeting. But he was not presiding over any meetings—he was swaying in motion, back and forth, reciting the Qur’an aloud. The Imam had already welcomed us shortly after we arrived. He asked what we were studying. 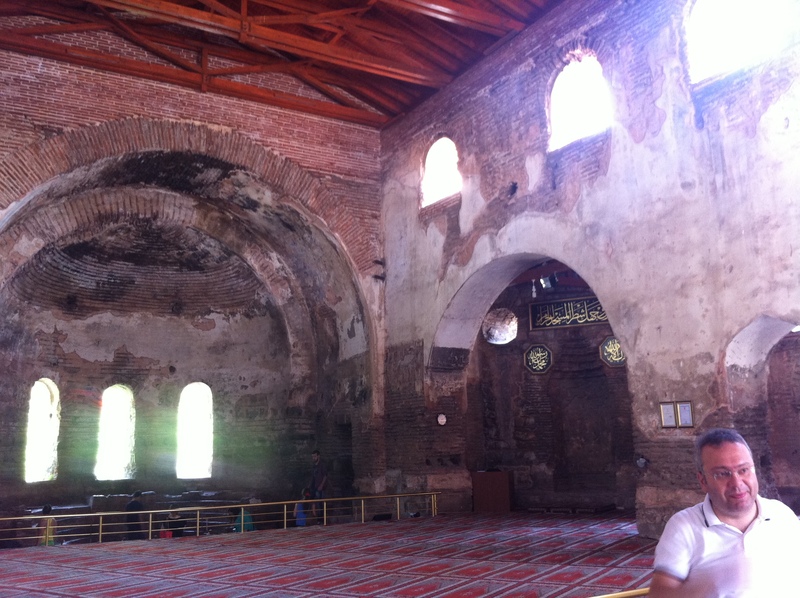 Left: The İmam of the Sultan Ahmed (Blue) Mosque, Emrullah Hatipoğlu, engages in what is probably a less interesting conversation than the one related here (yenisafak.com.tr). It was over the sound of the Imam’s recitation that the discussion on the other side of the room began. There, three Christian Americans sat with a Muslim Turk, debating theology. Muslim Ghanaians, Christian Koreans, Muslim Nigeriens, and Christian Germans filtered in and out, listening and asking questions—but none stayed the duration. As the outreach director of the mosque, the Turk was fluent in French and Arabic as well as English, which—after the Americans had exhausted their Turkish—became the language of the debate. “Islam is the logical religion,” The Turk insisted. While he spoke, he patted the Qur’an—but he consulted it only three times. To consult it was unnecessary. For all men, the Turk explained, the truths of Islam are self-evident. It is only delusion that leads one away from these truths. Blind faith in false gods, like the Christian God—or “natural science”—makes us ignore, or conceal, the truth. Even worse for these “concealers” is that the one true God does not forgive the association of false gods with Himself. I thought it odd that his explanation for the necessary existence of the one true God made extensive reference to natural science (an aforementioned false God), but I wasn’t sure I understood, and chose not to address it. We explained that his reason for God’s necessity seemed, to us, less a matter of logic than a matter of faith. He had an answer prepared. I nodded and we asked him to continue—but I did not fully comprehend the emptiness of his statement until the three hours had passed. No doubt built with logic in mind. Why—I later wondered—is “The Omnipotent” logically necessitated to give man only those tasks which he can logically understand? Is it not within the (all-powerful) power of God to instruct man to do such things as pray at least five times daily, to kill one’s own son, or to do other inexplicable things? And is it not the province of man to obey—to “submit” to the Will of God regardless? Is this not the very definition of Islam? I wondered: Why does this particular Turk put so much stock in logic (so much, in fact, that he justifies his belief in God with an appeal to a “false god”)? Why was it unacceptable to him that his religion could be, at root, a matter of faith? How can the revelation through Muhammad (the Qur’an), by comparison to logic, be so unimportant? Distilled—my thoughts led me to the only real answer: For some reason, the primacy of logic was very important to this guy, and I’m not sure why. Three more hours at Sultan Ahmed and maybe I’ll figure it out. In the following article, M. K. Bhadrakumar posits that Syria is moving toward the decisive phase, and that Israel—rather than Turkey—will be entrusted with the lion’s share of post-Assad security. Furthermore, many actors in the region are being brought together by an energy opportunity involving the U.S., Iraqi Kurdistan, Syria, and Turkey. Is this the solution to Turkey’s “Kurdish problem” in Syria? In the ultimate analysis, the US holds many trump cards, finessed through the Cold war era, to manipulate Turkish policies. This is quite evident from the centrality attached by Washington to the Iraqi Kurdish leader, Massoud Barzani, in the overall US strategy. Obama received Barzani in the White House recently. Barzani has become a “lynchpin” in the US-Turkish policies on Syria. This was within months of ExxonMobil signing up in October to develop the fabulous oil fields located in the Kurdistan region controlled by Barzani, ignoring protests from Baghdad that such a deal with a provincial authority bypassing the central government would violate Iraq’s sovereignty. Last week, the US oil giant Chevron announced that it too has acquired an 80% controlling share in a company operating in the region covering a combined area of 1,124 square kilometers that is under Barzani’s control. The entry of ExxonMobile and Chevron is a game-changer in the regional politics over Syria. The point is, the best transportation route to the world market for the massive oil and gas deposits in Kurdistan will be via the Syrian port city of Latakia on the eastern Mediterranean. Indeed, an altogether new dimension to the US-Turkish game plan on Syria comes into view. Siyah Kalem, a Turkish engineering and construction company, has bid for the transportation of natural gas from Kurdistan. Evidently, somewhere in the subsoil, the interests of the Anatolian corporate business (which has links with Turkey’s ruling Islamist party) and the country’s foreign policy orientations toward Syria and Iraq are converging. The US and Turkish interests overlap in the geopolitics of northern Iraq’s energy reserves. But Barzani is not only a business partner for Washington and Ankara but also a key agent who could leverage Turkey’s Kurdish problem. With Washington’s backing, he has launched a project to bring together the various Kurdish factions – Turkish, Iraqi and Syrian – on to a new political track. He held a meeting of the Kurdish factions in Arbil last month. Plainly, Barzani tried to bribe the leaders of various Kurdish factions with funds provided from Ankara. He claims he has succeeded in reconciling the different Kurdish groups in Syria. (The Kurdish insurgency in Turkey is led by ethnic Syrian Kurds.) He also claims to have persuaded the Syrian Kurds to snap their links with Bashar and line up with the Syrian opposition. BEIRUT, Lebanon—The Syrian regime Monday said it had the capability to use its chemical and biological weapons in case of a foreign attack, in its first ever acknowledgment that it possesses weapons of mass destruction. What I mean to say is that, barring the former, the latter was guaranteed to happen. After all, whispers of “chemical and biological weapons” have been going around for over a year, and there was no way this wasn’t going to end up in the ever-growing casus belli column somehow. What’s so important about this development is that is increases the scope of the Syrian crisis beyond the “Arab mandate” stage. Until now, NATO (via Turkey) has been effectively given a green light to invade Syria by mandate of the GCC(‘s pocketbook). But, since this is not a headline-appropriate reason for intervention, things like the Syrian-Turkish refugee situation, cross-border engagements, and a downed F-4 Phantom have all been tallied up and expounded upon in order to build a “legitimate” case to oust al-Assad. But after Libya, NATO’s PR department isn’t too eager to rubber stamp a Syrian incursion. That means that before the war in Syria can go public, so to speak, it needs a better story than NATO warmongering. WMDs fill that need. Once the situation in Damascus can be classified as anarchy (before or after it resembles the surface of the moon), it will be the responsibility of the international community to secure the weapons once possessed by al-Assad before they end up in the wrong hands. With the broader mandate brought about by WMDs, the end of the crisis, and the transition, will look a lot better on paper. Like Cappadocian wine, Turkish rakı will probably never find popularity in the global market (despite Diageo’s attempts), but perhaps small enclaves around the world will come to appreciate its unique taste as much as I have. I encourage my readers to pick up a bottle and give it a try, if they haven’t already. Fans of black licorice will be sold immediately—but even the early doubters may, in time, come to appreciate the taste. Sufi poet Farīd ud-Dīn ‘Attār’s 12th century poem, The Conference of the Birds, may not be easy to understand in its entirety, but one thing is made obvious: There are long-standing reasons to be skeptical about whether Sufism is really Islam at all. The former, like an eagle, flew up to the height of perfection in the twinkling of an eye; the latter reached the same summit, but it was by crawling slowly and perseveringly like an ant. I am the master of Rumi whose words are perfumed with sweetness. But in everything I say I am only the servant of Attar. Now that I have (perhaps) established that Attar’s masterpiece is worth reading (which I will maintain), I will say that I found it interesting—but not too enlightening. The poem itself (here’s a quick summary) is one large allegory dotted with smaller allegories, all of which attempt to explain the trials along the Sufi’s path to God and the human errors that cause failure. One problem is that some of the smaller allegories, told as parables, frequently served to muddle the point for me. The all-important Sufi conception of love (which is beyond reason) that the parables tried to demonstrate even seemed contradictory at times, especially with the all-important Sufi conception of “Self”-destruction. So fervent was their grief, so heart-broken their lamentation that they were admitted to the presence of the Sovereign. But, first of all, a register was placed before them, in which every detail of the deeds that each one of them had done, or had omitted to do, from the beginning to the end, was carefully entered. Seeing this list of transgressions, they were annihilated and sank down into confusion, and their bodies were reduced to dust. After they had been thus completely purged and purified from all earthly elements, their souls were resuscitated by the light of His Majesty. They stood up again, dazed and distracted. In this new life the recollection of their transgressions was completely effaced from their mind. This was baqa after fana, immortality after perishability, life after life’s loss, eternal existence after extinction. Now the Sun celestial began to shine forth in front of them, and lo! how great was their surprise! In the reflection of their faces these thirty birds of the earth beheld the face of the Celestial Simurg. When they cast furtive glances toward the Simurg, they perceived that the Simurg was no other than those self-same thirty birds. In utter bewilderment they lost their wits and wondered whether they were their own selves or whether they had been transformed into the Simurg. Then, to themselves they turned their eyes, and wonder of wonders, those self-same birds seemed to be one Simurg! Again, when they gazed at both in a single glance, they were convinced that they and the Simurg formed in reality only one Being. This single being was the Simurg and the Simurg this being. That one was this and one was that. Look where they would, in whatever direction, it was only one Simurg they saw. No one had heard of such a story in the world. Drowned in perplexity, they began to think of this mystery without the faculty of thinking, but finding no solution to the riddle, they besought the Simurg, though no words passed their lips, to explain this mystery and to solve this enigma of I and Thou. The Simurg thereupon deigned to vouchsafe this reply to them: “The Sun of my Majesty is a mirror. Whoever beholds himself in this mirror, sees there his soul and his body, sees himself entire in it. Soul and body see soul and body. Since you, thirty birds, have come here, you find thirty birds in the mirror. Had you been forty or fifty, you would have beheld forty or fifty. Completely transformed though you be after your journey, you see yourselves here as you were before. At the beginning of your journey, you were numerous, but only thirty of you are able to see Me, and what you see is your own selves. Finding the Simurg they found themselves and the riddle of I and Thou was solved. Is this pantheism? Panentheism? How could this have developed out of a tradition that describes its personal God as “King,” “Avenger,” “Praiseworthy,” “Slayer,” “Strong,” “Abaser” and “Independent.” Is this even Islam? The mere fact that some people think this way is, in my opinion, enough reason to give Attar’s Conference of the Birds at least one read. The ideas may be old, but in today’s Turkey, they couldn’t be more relevant. To an outsider, this may have seemed an odd situation. My bottle had just been taken by a concerned stranger at the park, who proceeded to pour my water into his half-full bottle, and back into mine. He repeated the process several times before handing it back to me. I wasn’t quite sure what to say. In Turkey, though, this is an act of kindness. Though I was quite pleased with the icy, refreshing temperature of my water, the Turks generally consider an icy drink an invitation for sickness—even in 34°C weather. 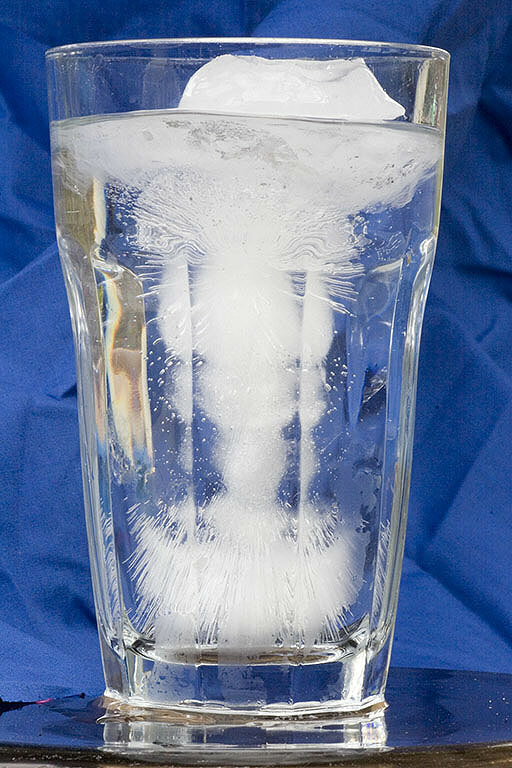 By mixing my cold water with his tepid water, the stranger was preserving my health. So what my friend İpek meant, of course, was to warn me that my water was still too cold to safely drink—not that the unknown contents of a stranger’s water bottle might be hazardous to my health. My chance of illness would, in fact, decrease as a function of however many strangers I mixed water with. For fear of further kindness, I have stopped imbibing icy drinks in public places. 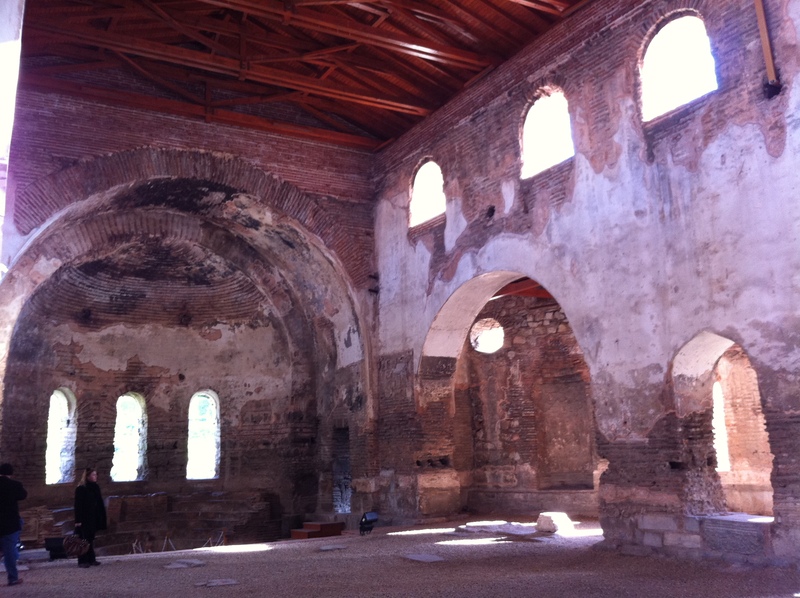 The İznik (formerly Nicea) Ayasofya Müzesi (formerly a church) has at last been converted into a mosque. I don’t think I should have to explain the symbolism of the secular state’s museum becoming a mosque—especially in light of the parallel controversy over İstanbul‘s Ayasofya (which is still a museum)—but I will take the time to mention that the conversion was tastefully done. In fact, the space has been shared so effectively between the faithful and the tourist that the former church now fully serves a dual function of museum and mosque. The remaining adornments of the former church—of which there are few to appreciate—are not only visible and accessible, but are separated from the carpeted prayer space. Even the altar is left alone. It was as if when the question of turning the museum into a mosque came up, someone said: “Why not both?” What would be useful to know, of course, is how that compromise was made. Is this Kemalism, still kicking? Or is this “moderate Turkish Islam” at work?